Download "SUMMARY WORKING DRAFT 2"
3 PHWG Working Draft 10/22/07 3 provide on-the-ground, cross-jurisdictional prevention of and response to infectious disease outbreaks, including pandemic influenza. G7. Assessment of capacity and ability to deliver 10 EPHS: There is currently no systematic, ongoing process to assess our capacity and our system s ability to deliver the 10 EPHS at the sate and local level. G8. Sub-State Public Health Infrastructure: Without a formal sub-state infrastructure, no one person, organization or agency is currently responsible for the coordination of all state public health related contracts at the district level, e.g. HMP, WIC, regional epis, LHO, Emergency Preparedness. G9a. Refugee and immigrant health needs: Currently there is no program within the ME CDC to address refugee and immigrant health needs; continued need for advocacy and enforcement on language access issues. G9b. Geographical and Resource Parity: currently there is great disparity when one compares the public health infrastructure across the eight districts. It is unclear how each district will be supported to effectively execute the 10 essential PH services, and/or if there will be varying levels of compliance/expectations depending on existing infrastructure. G9c. Greater Delineation of Public Health Duties: it will be important to clearly communicate who is responsible and accountable for specific core functions. To entities outside of the ME CDC there is not always clarity on this, and it could prevent future overlaps or gaps. G9d. Immunizations: as Maine s rates have fallen dramatically in the past several years, this issue presents a system change that requires immediate redress. G9e. Emergency Preparedness: Need on-going participation of the ME CDC in the county, regional and statewide efforts. G10a. Clarity of Roles and Authority; Coordination: Lack of clarity of roles for CCHCs and Regional [District] Coordinating Councils; lack of clarity of delegated authority to CCHCs, LHOs, hospitals and others; lack of resources for CCHCs and LHOs to assume delegated functions; lack of awareness and coordination of various parts of the system resulting in duplication or gaps; for consumer, a confusing system to access. G10b. Public Health Data: Lack of public health data by local service areas, counties, districts. G10c. Adequacy of Services: Inadequate mental health, dental and substance abuse services, especially in rural areas both inpatient and outpatient. G11. 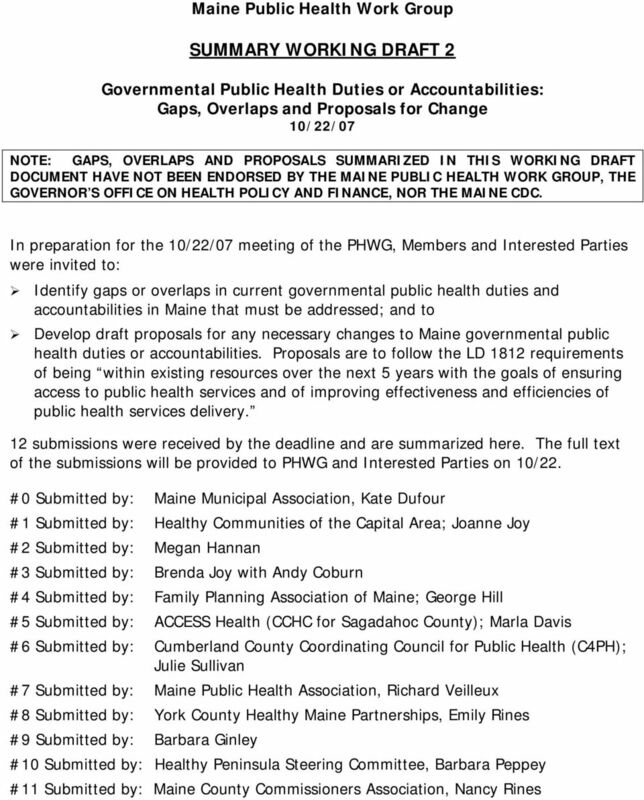 Regional [District] Coordination: Many of the components of a public health infrastructure already exist in the state of Maine, but lack adequate coordination. A regional approach needs to provide a central role for regional and local general-purpose government, i.e. counties and municipalities, through their elected officials. 4 PHWG Working Draft 10/22/07 4 Draft proposal for necessary change to address identified gap or overlap in current governmental public health duties or accountabilities: P0. Impact on Municipal Responsibilities and Finances: Ensure that existing public health-related resources are maximized not only to meet existing needs, but also to be potentially available to fund, if necessary, the identified gaps in the system. P1. Parties at Table: Develop a plan to have Behavioral Health, Dental Health, Schools Wellness and other identified parties at District ~ CCHC table. P2. Assessment Design and Data: District staff and coordinating body should assure reliability of local assessment design and data. P3a. Data to Assess our Capacity and Deliver of the 10 EPHS: Implement an accountability system for the state and the new districts to assess our ability to deliver the 10 EPHS. P3b. 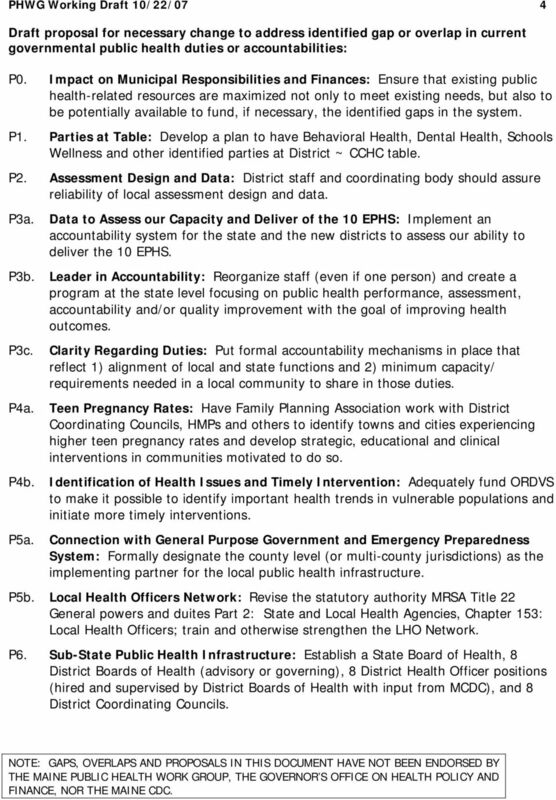 Leader in Accountability: Reorganize staff (even if one person) and create a program at the state level focusing on public health performance, assessment, accountability and/or quality improvement with the goal of improving health outcomes. P3c. P4a. Clarity Regarding Duties: Put formal accountability mechanisms in place that reflect 1) alignment of local and state functions and 2) minimum capacity/ requirements needed in a local community to share in those duties. Teen Pregnancy Rates: Have Family Planning Association work with District Coordinating Councils, HMPs and others to identify towns and cities experiencing higher teen pregnancy rates and develop strategic, educational and clinical interventions in communities motivated to do so. P4b. Identification of Health Issues and Timely Intervention: Adequately fund ORDVS to make it possible to identify important health trends in vulnerable populations and initiate more timely interventions. P5a. Connection with General Purpose Government and Emergency Preparedness System: Formally designate the county level (or multi-county jurisdictions) as the implementing partner for the local public health infrastructure. P5b. Local Health Officers Network: Revise the statutory authority MRSA Title 22 General powers and duites Part 2: State and Local Health Agencies, Chapter 153: Local Health Officers; train and otherwise strengthen the LHO Network. P6. Sub-State Public Health Infrastructure: Establish a State Board of Health, 8 District Boards of Health (advisory or governing), 8 District Health Officer positions (hired and supervised by District Boards of Health with input from MCDC), and 8 District Coordinating Councils. 5 PHWG Working Draft 10/22/07 5 P7. Process to assess capacity and ability to deliver 10 EPHS: Establish a systematic, ongoing process to assess capacity and delivery of the 10 EPHS at both the state and local levels; establish a position in MCDC to provide oversight on performance assessment, quality improvement, and provide leadership on accountability. P8. Sub-State Public Health Infrastructure: Establish 8 District Boards of Health and 8 District Health Officer Positions (hired and supervised by MCDC). P9a. P9b. P9c. 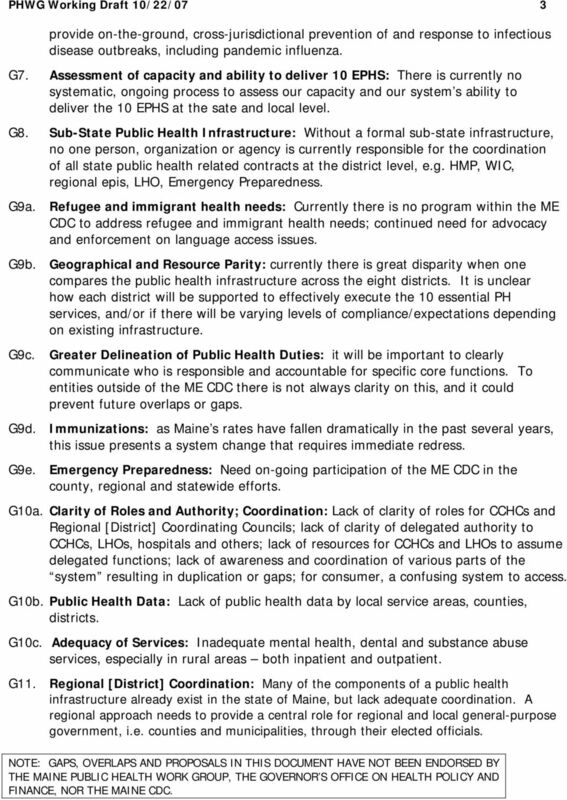 Refugee and Immigrant Health Needs: Implement a "Refugee Health Committee" or "Division" within the Maine CDC or DHHS. This Committee or Program would oversee all refugee health issues for the state of Maine. The Office of Minority Health would be an important participant/leader of this Committee. N/A Greater Delineation of Public Health Duties: Recognize that FQHCs can be part of the solution to delivering essential services (i.e.#7 linking people to care). Health centers are focused on being responsive to community or special population needs. P9d. Immunizations: Have greater fiscal support of state purchased vaccine as well as the ME CDC identifying why the system is no longer able to insure that children are receiving their age-appropriate immunizations and how to better support access for adults. P9e. Emergency Preparedness: Have on-going participation of the ME CDC in the county, regional and statewide efforts. Their presence at the table is essential in meeting core PH functions but would also enhance the communication between stakeholders. P10a. Clarity of Roles and Authority; Coordination: Build on current capacity, engage other key players, and recognize the unique distinctions structurally, resource-wise, and organizationally between rural and urban centers. Realize that we could have different models to address similar functions. P10b. N/A P10c. N/A P11. 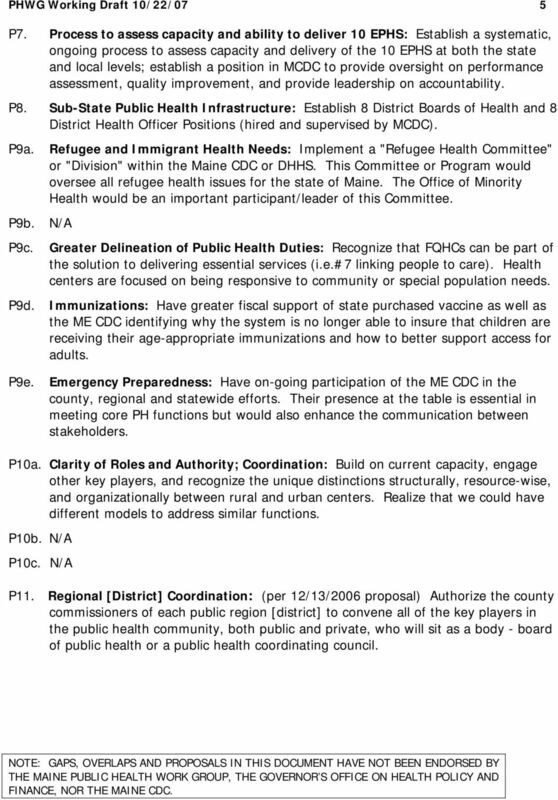 Regional [District] Coordination: (per 12/13/2006 proposal) Authorize the county commissioners of each public region [district] to convene all of the key players in the public health community, both public and private, who will sit as a body - board of public health or a public health coordinating council. 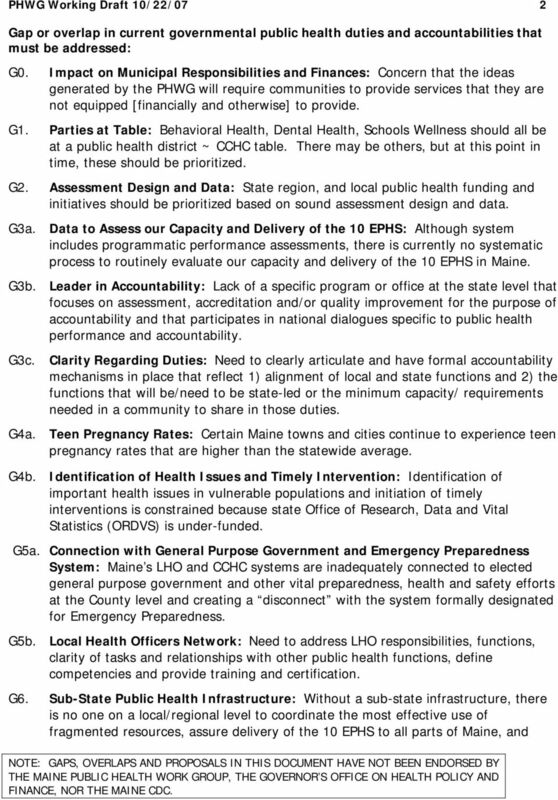 Report to the Public Health and Education Committees of the Connecticut General Assembly On School Based Health Centers Submitted by The School Based Health Center Advisory Committee (Established by P.A. a. Ensure ECHD representation on CHIP action teams. b. Ensure all ECHD staff are familiar with major trends in CHA data at least biannually. Final Audit Report Follow-up of the Audit of Quarantine, Migration and Travel Health and International Health Regulations October 2012 Table of Contents Executive summary... i A - Introduction... 1 1. COLORADO REVISED STATUTES *** This document reflects changes current through all laws passed at the First Regular Session of the Sixty-Ninth General Assembly of the State of Colorado (2013) *** TITLE 25.
www.simonejoyaux.com Simone P. Joyaux, ACFRE Performance Appraisal Process for the CEO 1 Note: This process and appraisal tool along with Joyaux CEO job description applies, in general to any organization. February 2016 Public Health s Approach to Youth Marijuana Prevention HB 3400 Legislative Report PUBLIC HEALTH DIVISION Executive Summary In November 2014, Oregon voters legalized retail marijuana sales.